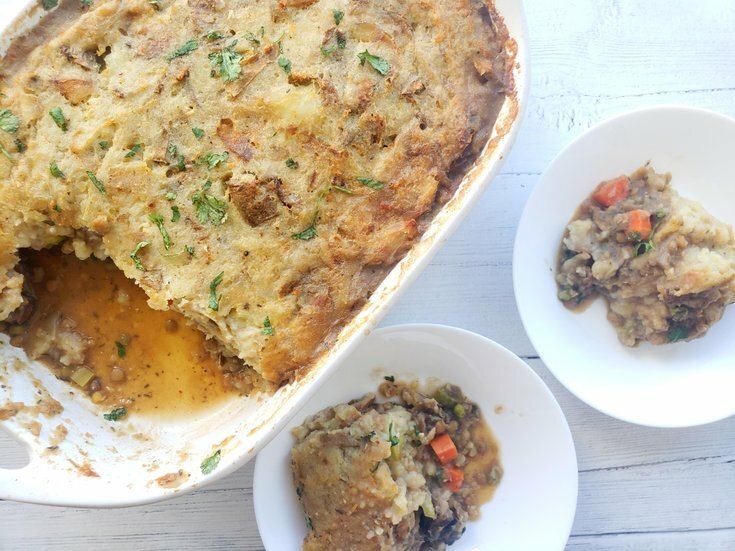 Use up your vegetables with this simple Shepherd's pie, aka Gardener's pie. Get that classic, rich-beefy taste with chunks of portobello mushrooms & lentils. Shepherd's pie, on the other hand, is a meat pie made from lamb filling, while cottage pie is made from beef. 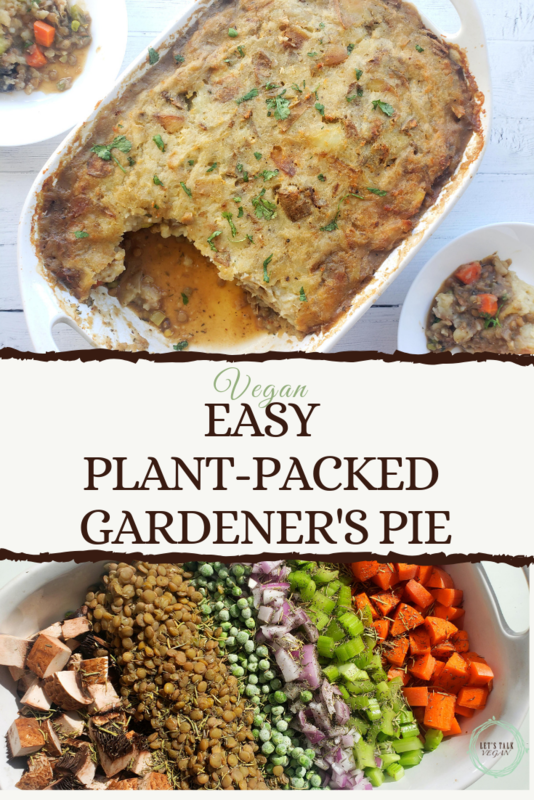 So, perhaps it makes more sense to call this recipe a Gardener's pie-a pie made from plants. Cook the lentils according to the package, but leave slightly al dente. They're going to be mixed in with the veggies and cooked in the oven later, so you don't want them to be overcooked. You can leave the skin on or off the potatoes. I'm trying to go zero-waste, so I am using as much of the plant as possible. Also, potato skins are super nutritious, with loads of disease-fighting nutrients and weight-friendly fiber. So, just by simply eating potatoes with the skin on, your meal will be much more nutritious. Well, that's enough of a reason for me to leave the skin. Whatever you decide, to peel or not to peel, slice the potatoes in large chunks (about 2-inches by 2-inches). Next, toss them with the olive oil and garlic. 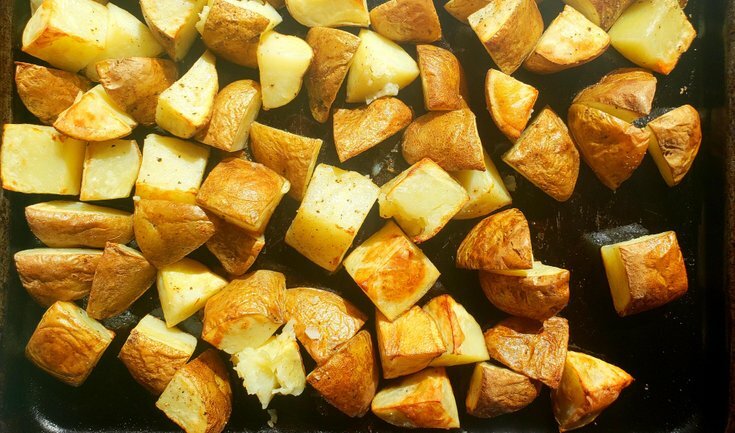 Then, dump the potatoes onto a large baking sheet. Cook for about 20-30 minutes or until a knife can be easily inserted into the side. Once the potatoes are cooked, use a fork to mash them on the pan. If you're using a large baking sheet, this should be quite easy. Then, add the potatoes to a large bowl, followed by the cashew cream and butter. Mash everything together, then set aside. Time to start assembling the layers! Go ahead and preheat the oven to 350° F.
the portobello mushrooms, diced carrot, frozen peas, cooked lentils, diced red onion, minced garlic, sliced celery, mushroom broth, flour, rosemary, soy sauce, thyme, and smoked paprika. Mix everything together, then smear the mashed potatoes over top of the veggies and lentils to form thick potato crust. 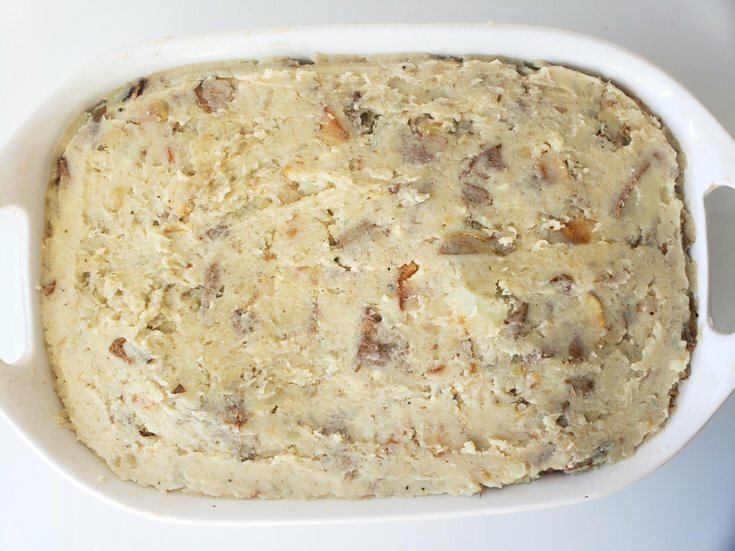 Traditionally Shepherd pies were lined with mashed potatoes; the sides, top, and bottom. If I had known this sooner I would have given this variation a try, it sounds delightfully delicious. 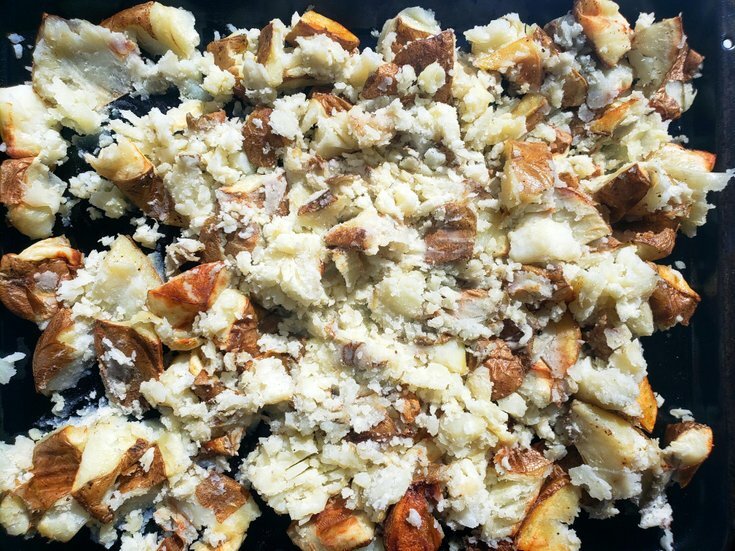 If you are feeling daring, make a double batch of potatoes and try it out. Make sure to tell me how it went in the comments below. To finish off, place the casserole dish in the preheated oven for 40-50 minutes. You can insert a knife into the side of the casserole to pierce a carrot to also check if it's done. The butter in the mashed potatoes will give your Gardener's pie a nice crusty top, with a soft tender inside. 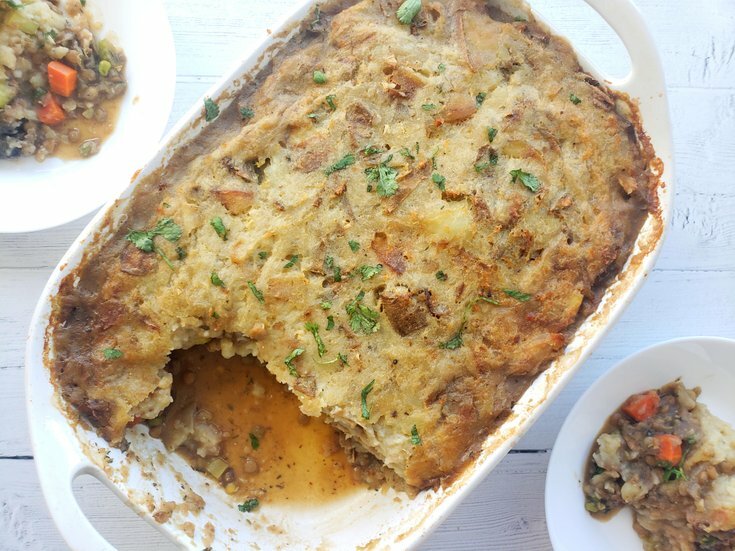 What to Serve with Shepherd's/Gardener's Pie? Hmmm, I honestly think that this Gardener's pie can stand alone at the dinner table. But, an extra side of gravy to drizzle over top, a hearty glass of wine, or maybe garlic bread would compliment this dish wonderfully. Or, perhaps, a salad with a light vinaigrette. You'll want your side dish to be on the lighter side since the veggie pie has such rich, bold flavours. Cook the lentils according to the package, but leave slightly al dente. Slice potatoes into 2-inch by 2-inch chunks. Toss them with olive oil, then dump onto baking sheet. Cook for 20-30 or until a knife can easily be inserted into the side. Once cooked, use a fork to mash the potatoes. Next, add them to a large bowl, followed by the vegan butter, cashew cream, and garlic. Set aside. 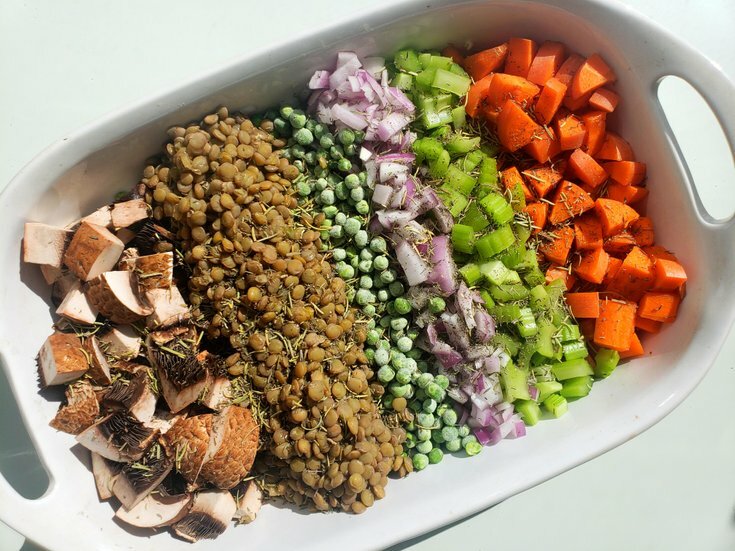 Now, in large casserole dish, add the portobello mushrooms, diced carrot, frozen peas, cooked lentils, diced red onion, minced garlic, sliced celery, mushroom broth, flour, rosemary, soy sauce, thyme, and smoked paprika. Mix together, then smear potatoes over top to form thick potato crust. Place casserole dish in preheated oven for 40-50 minutes.